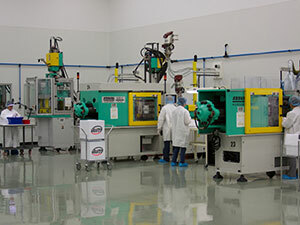 AIM’s in-house mold design and tooling construction offers significant benefits. Our corporate roots stem from highly skilled mold designers. We utilize the latest in mold design and flow analysis software, enabling us to produce very complex and precise SPI class production molds. Customers not only achieve their prototype requirements, they are also able to provide product for their start of early or regular production while their intended production source comes up to speed. AIM’s reputation and culture has been built around a system that streamlines tooling and molding practices. Innovative tooling options combined with a profound knowledge and history in molding prototypes, short runs and low-volume production products, allows AIM to deliver “production quality” parts in as little as 1 to 4 weeks. Prototype-Plus™ is a very popular option for companies involved with new, innovative, product development and market entry projects. This option is equally popular with companies seeking cost effective solutions for their short-run and low volume production needs. Rapid turnaround is achieved without compromise to intended design and part function nor are they subject to a limited offering of injection molding resins. With over two decades of short-run, low-volume production experience, AIM has perfected the techniques necessary to manage and successfully deliver products designed for the ever-changing healthcare marketplace. As an ISO 9001 / ISO 13485 certified company, we fully understand that quality is the foundation of our business success. For more information contact AIM Plastics Inc.